As you have probably seen on the other community blogs from our group, we are occasionally given hardware from various vendors to review. In this case, Bell Canada has provided me with a Samsung Ace, a Windows Mobile 6 device to try out. Before I get into my review, I want to preface it by providing you with some insight as to how I typically use mobile devices such as smartphones. This will allow you to get an idea of how I prioritize features the smartphone provides and allow you to understand why I grade things a certain way. I wouldn't define myself as a complete "power user" of smartphones, but I know my way around them pretty well. I use the features that can be considered most popular on smartphones (email and calendaring, phone, some web browsing, etc. ), but I am not the type of person who puts an 8GB memory card on my phone so I can load up all the newest games and gadgets. I don't often open up Microsoft Office documents or PDFs on my phone to view or edit them, but I have on occasion done just that so that functionality is fairly important to me. I occasionally use the camera feature but I wouldn't consider this to be a feature I use more than once a week. Outside of the "out-of-the-box" Bubble Breaker game included with Windows Mobile, I don't play games on the phone. For phone calls, I typically use my phone for business with some personal calls mixed in (I'd say the mix of phone usage is 80% business, 20% personal). From a hardware perspective, there are a few things that I consider to be very important to my experience with a smartphone. First is the feel of the keyboard buttons - before I was given the Samsung Ace to play with, I had a Blackberry 7250 (in a previous job, of course! 🙂 ) and the Motorola Q (with Windows Mobile 5). 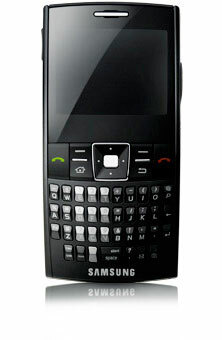 I loved the tactile feel of the flat buttons found on the Blackberry, and hated the rounded buttons on the Motorola Q. Second, the phone buttons (number buttons, call answer and call hang-up) should be very easy to reach without looking and should not get in the way of a typical phone conversation. Like I have said, I owned a Blackberry and the call hang-up button on it was positioned in such a way that I often hung up the phone mid-call by mistake. Third are the navigational buttons (like the center button, scroll wheel, etc.). These should be useable but should not cause me problems during normal use of the device (either during a phone call or while using the device as a mobile computer). So, with that essay complete, on to the review! I've separated the review into sections (Phone Experience, Email & Calendar Experience, Browsing Experience, Application Experience, Hardware Layout, Connectivity, Overall) to make the review a little bit more intuitive. The Samsung Ace is a great phone. It has a great form factor for phone calls (I personally don't like phones that are too small) and the fact that it is not a clamshell style is a big plus in my book (with previous clamshell phones I've used, I've had horrible experiences so I'm biased in that respect). The sound quality of the phone is excellent. The calls I receive come in crystal clear and signal strength is better than other phones I have used. A good test for this is my basement - signal strength is very low in my basement for other phones I have had and this phone has much better signal reception here. The buttons on the device facilitating phone calls are excellent. The "Initiate a Call" button and "Call End" buttons are large and easily accessible for use even without having to look at the device. On the flip side, the button to hang up a call has never caused me to drop a call inadvertently (per the comment I made above). The same experience goes for the wired headset that comes with the smartphone out of the box (see below). I have no comments regarding wireless headset experience (i.e. : Bluetooth headsets) as I do not have one to test the phone on. The email experience on the Samsung Ace is very good. The device picks up emails very quickly (actually, it consistently picks up new email in my inbox more quickly than my Outlook client!). Viewing email is great. Windows Mobile 6 allows for both text-based email viewing as well as rich, HTML-based email viewing and both display very nicely. The experience that HTML-based email provides is a real joy and really helps when you are given emails in HTML format (which were, for all intents and purposes unreadable on my previously owned devices). Finally, one of the features that is very welcome for me is the ability to read secured email through certificates. With Exchange 2007, you can send emails that are read-only, do-not-forward, do-not-reply-all, etc. and in my previous Windows Mobile device I couldn't read them but now I can. Calendaring on the Samsung is also an amazing experience. The richness facilitated by Windows Mobile 6 is fully available on the device and as a result, I can do pretty much anything with a meeting invite that I could on my Outlook client. The only thing I noticed was that in one case, a meeting invite that I modified to schedule it later in the day didn't seem to synchronize to my Outlook client. Lucky I caught that little inconsistency, but it did lead me to raise the point here. Browsing the internet is quick on IE for Mobile and it also says a lot about the speed of the Bell EVDO network. The mobile client browsing experience is nice and the images are crisp and clear on the screen. Forms control is usually pretty good, but occasionally I run into hiccups with them. Overall, however, the forms support seems to work quite nicely. There are a great number of applications on the Samsung Ace out of the box. Certainly many more than I saw on my previous Windows Mobile device. I already talked about Internet Explorer and Email & Calendaring above so I won't get into that again here. But the other applications on the device are plentiful and run very nicely on the Samsung Ace. Some of the applications of note are the International Usage application (to switch between CDMA and GSM - more on that in the "Connectivity" section below), the World Clock, Smart Converter (for measurement conversion), Tip Calculator and Live Search for Mobile are all excellent. Some of these are critical to me (Live Search for Mobile is one example - if you have a Windows Mobile 5 device or above, I strongly suggest you take a look at this free software here). Finally, I will say that the Samsung Ace is a fast machine. I don't have the lag problems I've seen on other devices. As I stated above, I've had good and bad experience with the layout of the hardware on smartphones. The Samsung Ace is actually pretty good with its hardware layout. I described the positives of the hardware layout with respect to phone calls and it's pretty good in that respect. The buttons on the keyboard, while not flat, are pretty good. It still took a little getting used to but overall I like what I'm seeing and experiencing in this respect. I am able to type as fast as I was able to on the Blackberry I used to have and certainly a great deal faster than I did with my Motorola Q. The layout of the various buttons is fairly intuitive as well - you can see fairly quickly how to operate the buttons efficiently and it doesn't take long to get used to them. I am also happy with the way the buttons light up in the dark. Only the symbols on the buttons light up rather than the entire button itself (e.g. : in the dark, the button for the "sym" button lights up only the word "sym", not the whole button). This may seem like a trivial matter, but to me it's aesthetically pleasing and actually helps me see the button better. The one downside to the hardware layout is the center button on the navigational pane. While it is serviceable, it is flush with the "left / right / up / down" navigation square, which may look nice but makes it a little tougher to click. Not a huge deal but if you're doing something quickly and don't press the center button explicitly, you may end up somewhere you didn't expect. The battery life is very good. With normal usage (for me), it will last two days (sometimes more) on a single charge which is a welcome change from my other phones. Finally, I want to talk about the screen. This is the crispest, clearest screen on a smartphone that I have owned and I would say it ranks up there with the best of them in that category. While it isn't the largest screen around (that honour goes to a phone starting with an "i"...), it is easily in the top echelon of smartphones for screen readability. The Samsung Ace is a great phone for a number of reasons, but one of the ones that makes it really stand out is its capability to act as either a CDMA or GSM phone. This phone will work under both networks, which is an incredible benefit if you are in an area not covered by CDMA. Although I personally have not had to use the GSM capability yet, I hear it is reliable so I can't comment about this first hand. Connectivity and synchronization with my PC goes off without a hitch. This is a great device for synchronizing data between the two and I have not had a problem with that yet. The only negative point to make in this category (and to me this is a big negative) is the synchronization cable. The Samsung Ace connector port on the device itself is proprietary which means you can't use a USB 2.0 A/B cable with it. This means if you lose or damage your synch cable, you'll probably be spending a lot more on a replacement than you would have if you could use a standard USB cable. You get a lot in the box when you get a Samsung Ace. In fact, more than you typically get. First, you get the smartphone (big surprise there). You also get the synch cable and power charger (two more non-surprises). What you also get are adapters for non-North American power plugs. This is pretty cool given it's something you'd probably be using if you were switching to GSM as most of the rest of the world uses GSM. You also get a wired headset for the smartphone which is nice. No bluetooth headset, but that is not an issue (nor did I expect it out of the box). What I was disappointed in not seeing (but this is also not a surprise as most phones don't include it in the box) is a car charger kit. It would be nice to see a manufacturer of smartphones include a car charger as part of the kit for a change. Finally, the documentation appears to be detailed enough to help you through most troubleshooting issues you might have, as well as an insert from Bell Canada on various overseas phone numbers to call should you run into technical problems. Of all the smartphones I have used on a daily basis, the Samsung Ace is by far the best one I've seen. In fact, I highly recommend it for anyone interested in a smartphone. It's a fantastic device, looks pretty slick, runs fast and has great signal reception. It's a great addition to the Bell Mobility lineup and I think it will be a very popular product. Do you have a Samsung Ace? Leave a comment and tell us what you think of it!